Step one: Pick a passage that you want. Listen to the whole video ( 3-5 minutes). 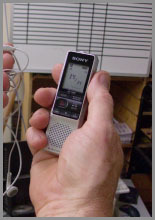 Step two: With your Sony Digital recorder, either record the song, or play and pause the song while you record the song in your own voice into the recorder. Step three: Print a copy of the words from the printable file of verses. Keep a few copies in your pocket and in the car. Step four: Listen three or four times a day, sing along with and without the song. Stop and reverse. It takes about two to three weeks of listening and singing and meditating. Practice your expression of every syllable. Hear the tune as you say the words. Important. Don’t get a head of the tune as you speak the words.. Sometimes, when I do that, I get confused. Speak at the same pace as the tune. Step five: Please e-mail me to tell me how it went. God has called you. “Now whatever you do, work at it as working for the Lord not for men, for you know that you will receive an inheritance from the Lord as a reward. It is the Lord Christ you are serving.” Col. 3 Feed my sheep. If you are a pastor, professor, teacher, or missionary, why not get a banner and a CD of your favorite passage to teach your group?